You. Your Business. One of a Kind. Milo Design is Sally Milo, long-time ebay seller. I'm a Certified eBay Stores designer who creates custom store headers, custom store pages, listing templates and logos for my fellow eBay sellers. I also offer remote one-on-one training of SixBit. If I don't have a listing for the graphic design you're seeking, I'll create one for your website graphics, business cards, postcards, social media, etc. You may want to take a look at winners of past eBay "Best in Stores" at http:/pages.eBay.com/storefronts/bestinstores.html to see how others set up their stores. (eBay hasn't had the Best in Stores contest in several years.) You can also look at my eBay design portfolio at stores.ebay.com/MiloDesign/Portfolio.html to see some I've designed and google "eBay design portfolio" to link to other designer's portfolios. Once you've created your eBay Store subscription, you likely did the Quick Store Setup when you subscribed, but those settings are not locked in forever. You can now edit your eBay Store up by going to your My eBay and selecting "Manage My Store" (MMS) under subscriptions on the left side as shown at bottom of image to left. On the classic store pages, you can also get to MMS by the Seller, Manage Store link at the bottom right of store pages. On new store pages, at the top right, is a link, Manage my Store. In this tutorial, any text in italics indicate a clickable link on the eBay page. Text in bold indicates a button to click. 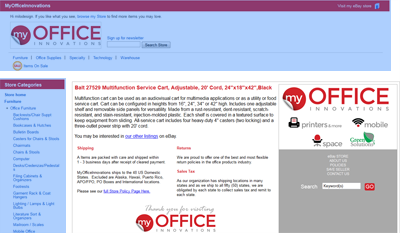 This is an overview page with links to various parts of Manage My Store. One of the first things you may want to do is set up your store categories. These can reflect the eBay category names or be those which make sense for your offerings. It is assumed you will have already decided which categories you want in your store and any sub-categories you may wish to have. Of course, consider what is easiest for you in your organization of categories, but it's most important to set things up in a logical manner from the point of view of shoppers. 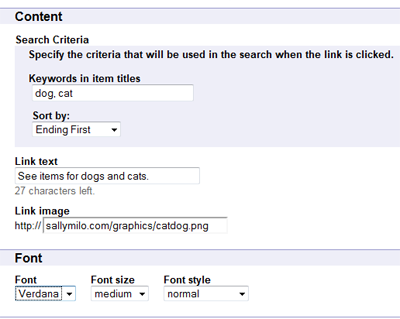 You may have a total of 300 categories and sub-categories, each one up to 30 characters long. I recommend 10-20 top-level categories if you will have many store categories to make it easiest for shoppers to narrow down to the item(s) they're seeking. Think SEO (Search Engine Optimization) when naming your store categories! They should be named for product types and brand names, if appropriate. Please note, if you later modify, add or delete your store categories AND you use listing software such as SixBit, Turbo Lister or others, you will need to follow your software's instructions to update your store categories in that program. In this tutorial, we're setting up an eBay Store for a coin seller (fictitious name here: ABC Coins Fake Store - though I'll be using ABC Coins as the name in these samples), so categories and other information will consider that type of business. You likely sell other items, so please be aware you may set up some things differently than in this tutorial. A new page will open. Add your category names in the fields as shown to right. If you click the Add more categories link at the bottom of the Category Name fields, more fields will open below the Category Name fields. We have our 3 main store categories set up for ABC Coins, but now need to create subcategories in each. To add sub-categories to US Coins, click on US Coins as shown to left. It opens a page to which you add these second level store sub-categories. You may add third level categories by clicking on the second level category links as just done for creating the second level categories. This is the section from which you name your eBay store, select its logo and enter its description - or to change these in the future. Click on the Change link to the right in the Basic Information bar to edit these settings. On the Edit Basic Information page which opens from that Change link, enter your store name and description into the appropriate fields. Resist the urge to use fluffy, "Welcome to our eBay Store" sort of text in the description: USE KEYWORDS such as the product you sell, brand names, etc. - terms shoppers may search on. This will assist in search engine placement. You next choose a store logo from this section as shown below. You may use one of the eBay-supplied logos as shown to right above, you may upload a 310 x 90 pixel store logo image to eBay or you may enter the URL of the store logo you have hosted online off-eBay or choose to not display a logo. The store theme is the general layout of your eBay Store. You may click the link to Change to another theme to pick a different layout. Look thru the various available themes by clicking on theme links shown in image to right. Please note, the Custom Header Only theme under Easily Customizable will not include anything in the header until you insert your custom HTML (with graphics, if appropriate) into the Custom Header (more on this later). To change the color scheme, when you click on the Edit current theme link, the page below will open. You may click on the color chooser to open the palette shown and select your colors that way. If you have custom colors, you will enter their Hex Color code into the fields. (Some photo editing software, such as Photoshop, will provide the Hex codes in the color chooser. You might also do a web search for "hex color chart" to find many pages with the colors and their Hex codes.) Click Save Settings to save your color scheme. The Left Navigation Bar settings allow you to choose whether or not you want to display a store search box, categories, buyer display options and links to your store pages. The Store Header Display settings allow you to insert a custom header if you wish. (This is custom HTML you insert.) If you want a custom header or to add info to the header, you'll check the Yes, include? radio button rather than the No, do not? button as in image to right. 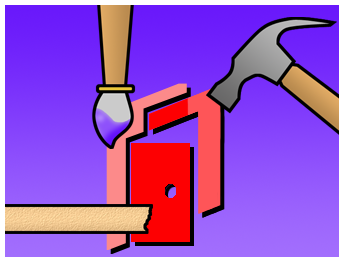 By clicking on the Stores HTML Builder link, a pop-up window will open. Within that window, you can create links to items, a Store page or Store search which will appear in your header. On the Edit Store Header Display page, you may also choose to have a minimal eBay header on your store pages IF you have a subscription for a Premier or Anchor Store. On the Display Settings page, your last option is to set the Item Display. Choose whether you want your store to display in a list or gallery view and to sort via highest price, lowest price, ending first or newly listed. This is how your shoppers will see your listings when they first visit your store. Please see this advanced information below. You may click on the Guided Setup link for an easy way to create promotion boxes in your eBay store. On the Guided Setup page, you may choose to include the default promotion boxes or may change (edit) them by clicking on the Change promotion box link. As those steps are easy to follow, this tutorial will show you how to create a promotion box without using the Guided Setup. To begin, click on the Create New Promotion Box button as in above image. From the Promotion box types page which opens, you'll select which type of Promotion box you're creating - to Advertise items, Provide links to other parts of your Store or to Communicate to your buyers (fully customizable) as in image to right. Click on the Continue> button once you've chosen the type. This opens a page on which you select the Promotion Box Location and Store page(s) where that promotion box should appear. Click on and Refresh preview the various display types to choose which type of promo box you want to create. Choose the Item selection criteria. You may rename your Promotion box title if you wish. (Click on Refresh preview to see how your new title looks.) Select the ending time period and from which category to show items in this promo box. Name your Promotion box for your own information. You may then want to Preview sample page then save your promotion box you've just created. If you don't want to currently use this promo box but do want to save it for future use, select Remove from the Actions Drop-down selector as shown to right. You will then be able to Make this promotion box inactive or Delete this promotion box permanently. When you do want to activate this promotion box, click on the Inactive link to see this (and any other inactive) promo box listed as in sample to right. This lists your store pages and store categories. eBay adds keywords to each by default, but you should edit these by clicking on the Edit your keywords for... link on the right side of each page or category. As the title of this section indicates, these keywords are valuable because they aid search engines in finding your eBay store and items. One seller of vintage postcards I know spent a fair amount of time on this to good results; in her second-level categories of each state, she entered popular cities for each state as her keywords, thus if someone were to google Dearborn, MI postcard, for example, chances are her eBay store will pop up pretty high in the results. 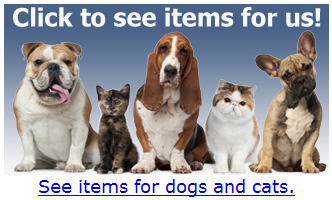 For example, if you want to create a link (both text and image) to your listings for items with dog or cat in the title, you'd complete the content section something like this to the right. This page lists Manage My Store features with links to more information about each. These are the sections under Email Marketing: Create Email, Pending Emails, Sent Emails, Mailing Lists, Subscriber Lists. Click on the button to Create Email to get to the creation page. You will chose your type of Email (Welcome, Ending Soonest, Newly Listed, Previous Purchase, Items on Sale or Custom). For any type other than Custom, select the template layout you want, click the Continue button and complete all on the resulting page. For the Custom email, select that, click the Continue button and complete all the fields. In the Personal Message box, you will add the HTML and text you want to appear in your email. Any emails you created but haven't yet sent out will appear in this section. Emails you've sent out will appear in this section. Any email lists you've created will appear in this section. The ebay IDs and date each signed up for your newsletter appear here. A listing frame goes on all of your listings on ebay; it includes your store header (the default eBay, one - not customized) and your store categories, if you want to include them. Your header will appear in the colors and with the logo you set up in Display Settings. Select the features and add links you may want to include, then click the Apply button to apply the listing frame to your listings. The areas highlighted in blue to the left show the header and store categories in one sellers' listing frame. You may create a promotional flyer to print out and distribute as you wish. Click the Create Promotional Flyer button to go to the page on which you'll select the information to be included in this flyer. Keeping most of the default settings, this 8½" x 11" printable flyer (image to right) was generated for ABC Coins. In the Custom message field of the flyer creation page, you may enter HTML if desired. STOP! Right now! Click on the RSS Feeds link in MMS and select to Activate your fixed price listings through RSS, then click the Apply button. This will send out your listings to search engines, thus improving their chances at being found by searchers for your type of products. eBay has a tutorial about Markdown Manager at http:/pages.eBay.com/stores/markdown-manager/tutorial/index.html. Learn how - and why - to apply discounts to one, more or all of your store items. You may set up rules to cross-promote other items you have on eBay when a shopper views or bids on another item. For example, if ABC Coins receives a bid on a Morgan dollar, they may wish the bidder to view other silver US coins they have listed. You may select the items which you want to promote to those who have you chosen as one of their favorite sellers. You may choose to promote your items on other sellers' notices and closed eBay listings and have other sellers' items promoted similarly on your notices and closed listings. As of 11/23/13, the link to Logos and Branding goes to a "Manage Buyer Communication" page. You may edit your invoice, manage questions and link to email marketing from this page. Traffic reports provide info you can use to learn what keywords buyers use to discover your items and to see what pages they view in your ebay store. Use this info for fine-tuning your marketing efforts. Quick Store Tuneup - General recommendations "that have worked for other successful Store sellers"
These comments are my own based on my own experiences and observations. Having an eBay Store, even a slick, well-designed and well-organized Store, does NOT mean you'll have customers! You HAVE to market your eBay business and do the best practices as advised by eBay to attract shoppers and buyers. All aution and fixed price items you list will appear in both your store and in search results pages on eBay. Spending time on the discussion forums, workshops and burrowing thru eBay's Help files can be quite useful - not only to learn about eBay Stores, but about being an eBay seller in general. Running an eBay business is not only about listing and shipping, but about growing! FAQ document - Word document you can modify for your own custom FAQ page. (Copy text to Notepad; the formatting Word adds in is HORRIBLE for web pages! Customize your store - Some tips & tricks I've used over the years. eBay's Special Stores HTML Tags - Special tags you can add to your eBay store pages to display various things. (eBay.com no longer has the page up, this is the UK page; tags work on .com. 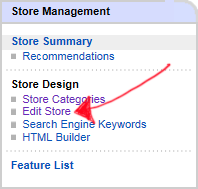 Click on the Manage my Store link near the top right of one of your store pages to edit it. Then, click on the Edit Store Link as shown in image to right. On the store edit page, you can enter (or change) your store name in the first section. "Billboard" is the next section. A billboard is a 1200 x 270 pixel image to top your store pages. Click on the Add image link in the billboard section to select the image you want to use. "Logo" is the next section. Add a 150 x 150 pixel image with your logo. Description section - You have up to 1000 characters to enter a description about your ebay store and items. This is for search engines more than shoppers, so use as many keywords and phrases as you can. Items and brands you sell will be picked up by search engines, so use 'em! Featured Listings section - You may choose up to 4 items to feature, otherwise eBay will select 4 based on your choice of ending soonest or newly listed. Be sure to check your store regularly; if one of your featured item sells, it will disappear from this section. Listings section - Select the order you want your store listings to appear in and your item layout (List or Gallery).